Three days after bombs shattered its most joyous day, Boston came together Thursday to seek comfort, honor the victims and, in the words of one minister, heal a city and a violence-weary world. First lady Michelle Obama, former Massachusetts Gov. Mitt Romney and other dignitaries also attended the service at the Cathedral of the Holy Cross, less than a mile from the marathon finish line. During an interfaith prayer service at the Cathedral of the Holy Cross, Boston's Mayor Thomas Menino praises the resilience of the city and its people who, with tears in their eyes, "triumphed" over the deadly explosions that shook Boston on Patriots Day. Rev. Liz Walker of Roxbury Presbyterian Church opened the service with the message of healing. Other speakers sought to reassure a heartbroken city that it would find strength in its grief. Obama offered prayers for the families of the dead and praised Boston as an open-hearted city, one of the world’s greatest. He also cited personal ties: The president attended law school at Harvard, across the Charles River in Cambridge, and was catapulted to political prominence by a speech at the 2004 Democratic National Convention in Boston. During an interfaith prayer service, President Obama talks about his personal connection to the city of Boston following two deadly blasts, recalling his days studying at Harvard and speaking at the 2004 Democratic National Convention — when he was just a senator with a hard-to-pronounce name. People began lining up as early as 6:30 a.m. to get into the service, in a line stretching 10 blocks, The Boston Globe reported. About half the seats were reserved for police, other first responders and families of victims. Runners, nurses and other well-wishers also turned out. The service took place while investigators looked for two men they want to question in the blasts, which killed three people and injured 176 on Monday. Earlier Thursday, Obama met with the family of Krystle Campbell, one of the three people killed in the attack. After the service, Obama went across the street to a high school gym and thanked volunteers, and later to Massachusetts General Hospital to visit patients. 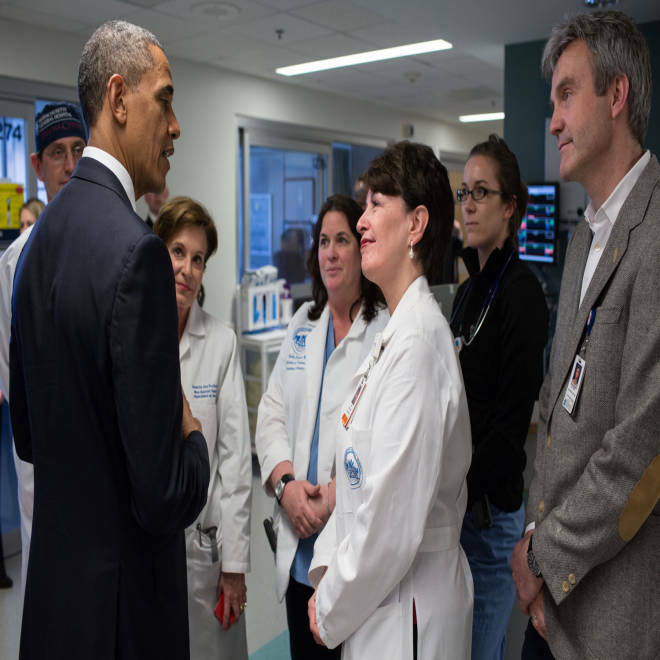 President Barack Obama talks with staff at Massachusetts General Hospital in Boston, Mass., April 18, 2013. The President visited the hospital to meet with patients who were wounded in the bombings in Boston, following an interfaith prayer service at the Cathedral of the Holy Cross. As the city struggled back to life, the Boston Bruins played the first professional sports event since the bombings. During the national anthem, a crowd of more than 17,000 joined in singing, and was cheering and belting out the song by the last lines. The explosions took place on the most celebrated day on the Boston calendar — Patriots Day, a city holiday commemorating the battles of Lexington and Concord in the American Revolution. The cathedral was dedicated in 1875. It is led by Cardinal Sean O’Malley, the archbishop of Boston, who was considered a candidate for pope earlier this year. At the service, he offered love and support from Pope Francis, and he invoked the runners and race volunteers who rushed to help victims of the blasts.